Nebraska’s David Harwood answers a question from Jackson Belva during a Geology 125 course. Harwood served as a principal investigator in the National Science Foundation-funded SALSA project. 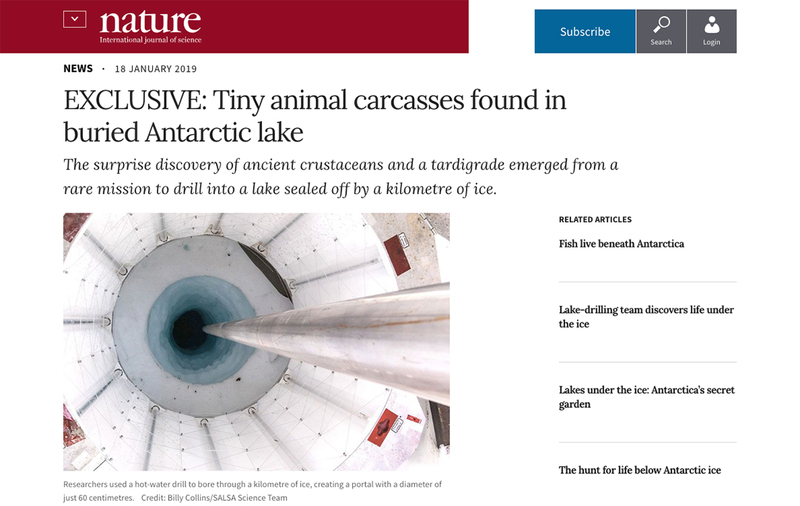 David Harwood’s cursory discovery of microscopic animal remains in samples taken from a lake deep beneath the Antarctica Ice Sheet is featured online in an exclusive report by Nature, the international journal of science. The creatures — believed to be crustaceans and a tardigrade, or “water bear” — were discovered as part of the National Science Foundation-funded Subglacial Antarctic Lakes Scientific Access, or SALSA, project. The United States-led, multi-institutional expedition collected water, basal ice and sediment samples from Mercer Subglacial Lake. The body of water, located 1,200 meters below West Antarctica’s Whillans Ice Plain, is nearly twice the size of Manhattan and has been cut off from the ocean and atmosphere for millennia. Harwood, a professor of Earth and atmospheric sciences at the University of Nebraska–Lincoln, said the discovery was completely unexpected, made while he searched lake samples for the fossil remains of diatoms. Nature is featuring David Harwood's discovery of animals within samples collected from a lake below the Antarctic Ice Shelf. The find was part of the NSF-funded SALSA research project. Some of the creature fragments showed signs of degradation, while others looked to be more “fresh” both in color and with delicate hairs. The creatures could have come from a variety of sources, ranging from animals that lived in the lake; were deposited in the sea that covered the area during a period of ice retreat, or were frozen into overlying ice upstream and are raining down from the glacier as it moves across the top of the water. “Finding out how these creatures got there or if they might live in the lake is the next step,” Harwood said. That work will be completed by other SALSA researchers as Harwood returns to studying fossil marine diatoms found in the subglacial lake. The SALSA study was assisted by a team of Nebraska engineers and drillers who used a Husker-developed hot water drill to tap into Mercer Subglacial Lake. The drill was built and maintained by a collaboration between Nebraska’s colleges of Arts and Sciences, and Engineering. It provided the SALSA science team with clean, uncontaminated access to the lake. The project also included the deployment of Deep-SCINI, a Nebraska-developed submersible robot, to collect video images. A precursor to the submersible was used to discover a new species of sea anemone in 2010. The anemone was named Edwardsiella andrillae in honor of the international ANDRILL program, an Antarctic Geological Drilling effort led by Harwood from Nebraska’s Antarctic Science Management office in Bessey Hall. Learn more about Nebraska’s involvement in the SALSA research project.